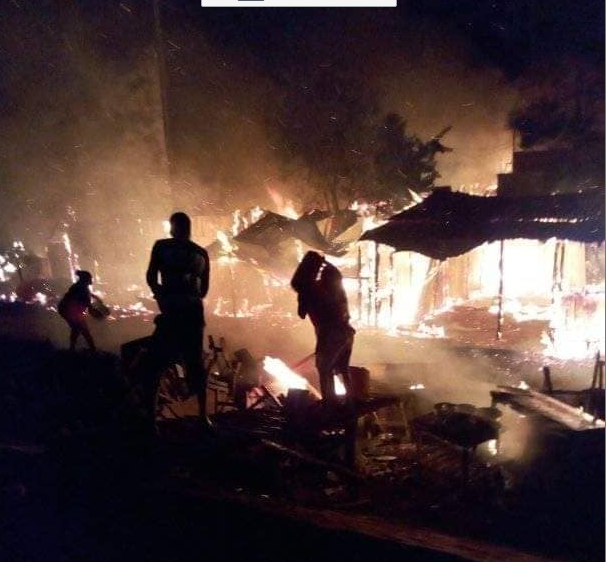 OYAM – One person reportedly died while three others sustained facial burns after a petrol container caught fire and exploded at their grass-thatched house at Minakulu Trading Centre, Minakulu Sub-county in Oyam District on Wednesday. The deceased has been identified as Junior Anyoli, 8. Those admitted at Lacor Hospital in Gulu in critical condition are Sarah Akello, Gerald Okite and Winnie Auma. The incident occurred when petrol stored in a plastic drum caught fire and consumed the grass-thatched hut. The fuel in a 20-litre plastic drum was being sold by the family. Mr Johnson Omara Aroma, the victim’s grandfather told Daily Monitor on Thursday morning that cooking oil which was being used to fry food caught fire and later spread to the petrol container. “Cooking oil in a saucepan first caught fire and in an attempt to put it off, Sarah Akello picked the saucepan from the stove and threw it on a 20-litre drum containing petrol. At this point, the petrol container caught fire and exploded burning four people who were in the grass-thatched house,” he said on phone. Mr John Gutenberg Ogwang, the LC3 chairman of Minakulu Sub-county, regretted the incident, further advising residents not to keep fuel near fire. “Selling petrol at home is illegal,” he warned. Last year, a retail trader in Minakulu died after a petrol container caught fire and exploded in his shop.